There is palpable fear and confusion in Ede, Osun State the home town of Senator Isiaka Adeleke, as his lifeless body was returned to the Ladoke Akontola University Teaching Hospital, Osogbo, for an autopsy. Sympathisers have waited at the deceased residence preparing for burial according to Islamic rites. The autopsy option, sources say, becomes necessary following rumours that he was poisoned at a political meeting on Saturday. 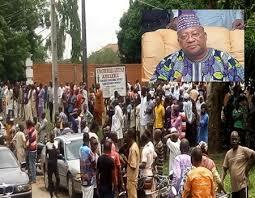 Late Adeleke was preparing to run for the Osun governorship election in 2018 before his death on Sunday morning. He was earlier brought home from the hospital amidst wailing and weeping by supporters and family members. The development has resulted in a traffic gridlock across the streets of the town. Supporters are also lighting bonfires across the town to register their anger, raising fears of possible violence.